This month the subject for T-SQL Tuesday is “T-SQL Best Practices” chosen by Amit Banerjee (Twitter|Blog) . I will describe here a problem that happened some days ago in a customer, and just changing a little thing in the query made all the difference. The customer told me that some queries have been running slowly, so my job there, was dig further and find what have been wrong. I found out that all of these queries have been using “convert implicit” and none of indexes have been used. And just put the value of where clause in quotes the index began to be used. I’ll put some some code below to illustrate the example. Executing the query we have the execution plan below. 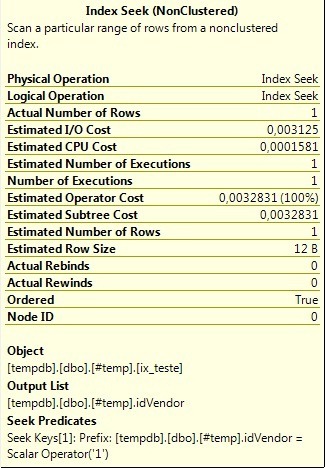 As we can see, the nonclustered index didn’t solve my problem because a convert_implict was made to satisfy the query. 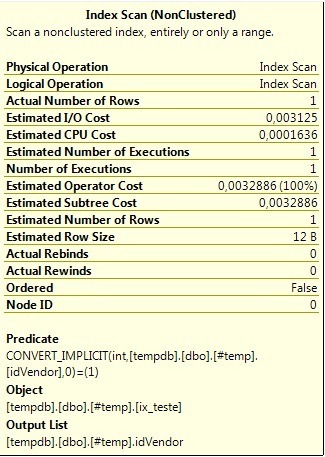 So, just doing a T-SQL best practice we avoided a convert_implicit and an index scan for the query. Posted on July 12, 2011, in T-SQL Tuesday, VirtualPass and tagged SQL Server, SQL Server Pass, T-SQL Best Practices, T-SQL Tuesday. Bookmark the permalink. 1 Comment.